When Glory Lockhart is prodded into going on a blind date by her friend Connie, no one could have predicted the strange and terrifying turn of events that would take place when her gentleman caller, Tom Rankin, takes her for a romantic ride on a Ferris wheel at a county fair. But when the wheel returns to the ground, Glory finds Tom dead–shot in the back. Immediately, questions course through Glory’s mind–why was Tom killed and who killed him? She had barely met this man, but now she feels connected to him in the most permanent and horrible way possible. 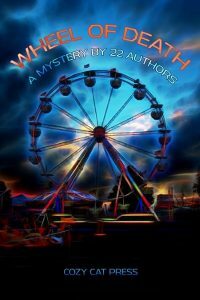 As the widow of a former local police officer, Glory’s head is soon humming with plans to solve the mystery surrounding this man and his gruesome demise on the wheel of death. I am the publisher at Cozy Cat Press and this is our second group-written mystery. Our authors are like an extended family and we enjoy working together. Each author is assigned a chapter and the one assigned Chapter One starts the story and then sends it to the author assigned Chapter Two. We follow this process until the book is complete. The author assigned Chapter One developed the main characters and other authors added (or in some cases, subtracted) characters as we went along. The operator lifted the gate and Glory unlatched her seatbelt and got off the ride. "You have a lot of explaining to do, Tom Rankin!" With a scowl on her face, she turned around. However, Tom remained where he was on the ride, still slumped against the bear. "Tom?" Glory called out. "Tom! Get off the ride!" "I'll get him, miss" the operator said. He moved over to Tom and shook him by the shoulder. Unresponsive, Tom slid down behind the bear and lay there, unmoving. "Dang, lady. What'd you give him to drink anyway? He's gassed," the operator called back, in a half laugh. Some of those waiting in line laughed also. "Nothing. We didn't have anything to drink." The smile on the operator's face faded and he turned back to Tom. He leaned over to try and coax him awake. The operator instantly stood up and jumped backwards. The operator turned to look at Glory, his face ashen and drained. "Your friend . . . he's dead!"